I did enjoy this Anime. The intro of the story felt like a slice of life and then the next part of it is like turning a page in a book only to show another wonderful page of art and feelings. This continues throughout the story and we get to know the characters in a deeper melody. Warning: This is not anime is not for the thrill seekers, The best way to describe it is like watching a flower bloom, and the best way to see it is just to let the story take its time to unfold and see the beauty as it appears. It's a very simple sci-fi story, with about an hour of run time (once you subtract the end credits rolling). This movie doesn't spend much time on explanation - just the bare minimum - in order to keep moving along. It's very streamlined. There are some brief action scenes, although they aren't particularly memorable. There are some emotional scenes as well. This is essentially like a modern fairy tale, so you should just go into it with that mindset. There will be loose ends and things that don't quite add up, but you have to just chalk it up to the simple type of story it is. No gore, and one brief bathing scene. so there was a little bit of bad cgi, part of the plot wasn't all that strong, the reveal was pretty obvious, the "action" part of the side story wasn't necessary, and yet I loved it. If you've ever lost someone close in your life it will play on those emotions. this is about closure for those who survive loved ones. The animation was beautiful, the tech was a form of augmented reality, and it made me cry. I've lost people I'd give the world to see again and this plays on real emotions. The emotional story is grounded. the only way it could have been better would be if it cut out the action and focused more on the emotional journey. I feel the action was thrown in to appease a studio and to pad the run time but if you look past it it was a beautiful take on closure. This is a single episode show that has a really good storyline, some great graphics, and likeable characters. Somewhat sad, but a beautiful ending that makes you want to see what happens next (which we just have to leave up to our imagination). So why the 4 star rating? The pacing seemed a little bit rushed, and didn't quite explain some of the things that went on. It could have used just a little bit more explanation and slowed things down a tad. Not enough to make it a full series, but maybe 20-30 minutes more. Good Movie! Simple Story and Message Delivered! I don't tend to write reviews but I just had to! It made me emotional at the end and I think the message really delivered by the end of the movie; if that was the goal then good job! 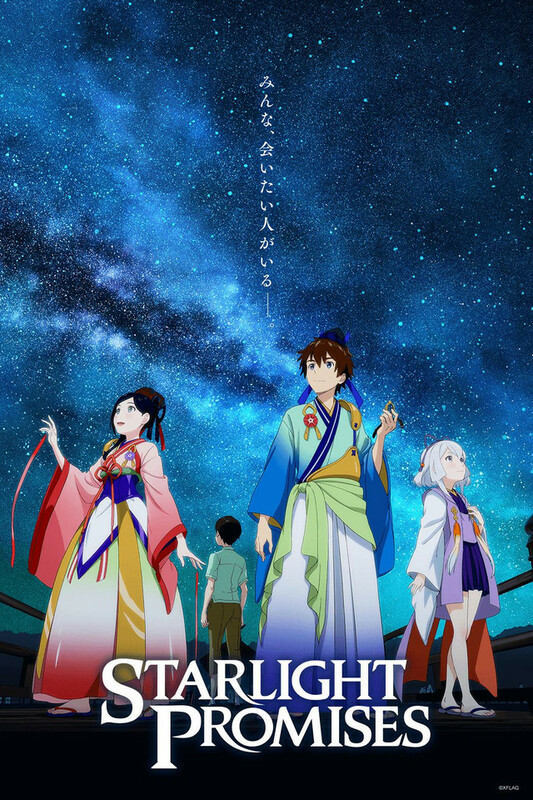 Starlight Promises is a good watch and I really didn't expect much coming into this! Ultimately the movie pays off and was easy to get into even though of it's shortcomings! Definitely will recommend it and I hope more people take the chance to watch it! A heartfelt journey, short and sweet. I'm no expert reviewer, this being the first I've written. However, I believe that I must. Starlight Promises is an amazing movie. Because it's a movie, the plot moves along smoothly, and there aren't really any cliffhangers in it. The story isn't complex, but it's touching. There is a bit of conflict, but it honestly seemed to exist only so that there would be a conflict, and of course it wasn't the main focus anyways. The art is beautiful, and when it uses 3DCG, it looks quite nice. I won't spoil exactly what the ending entails, but it is very touching, and then it ends pretty much right there, without much of what happens after the main plot, which I thought worked well. If you watch until after the credits, there is a very short thing, so you may want to watch that as well. I recommend this movie for those who want to see some bittersweet moments, and also for anyone looking for a mostly laid-back pace. Prepare a tissue for the end. This story just goes to show that Japan makes feels stories to make you cry, and when they do, you cry. It's a heartful story that keeps your attention from start to finish. It feels like they could have used a bit more time to explain some things, but the rhythm of the story worked in the end. I would recommend this to anyone who wants a heartfelt romance. If I had known what this was I wouldn’t have watched it, and I would have missed out. In an hour you can’t get truly connected to the characters but it was such a clean and beautiful story that did a lot with just an hour. Also the closing song is amazing, I’m going to find it and buy it. This movie is beautiful and moving but some elements seemed random to me. AI systems and ghost samurai were not needed... the story would have been moving and beautiful without it and there would have been more time to flesh out characters in that time.